Today I’m sharing all the cute items I have planned for Evelyn’s Easter Basket! I’m trying to keep it simple this year and on a budget, while still splurging on a few items I’ve been wanting for a while! I’m so excited! 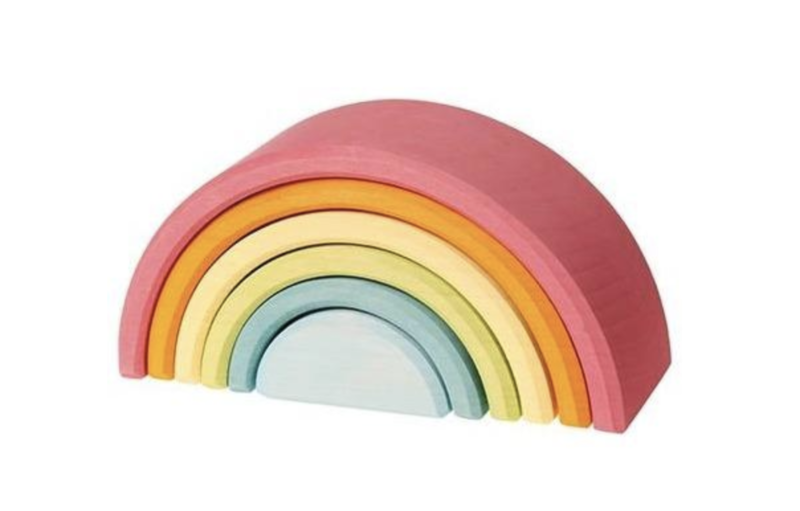 Mini Wood Rainbow Stacker – Grimm’s Toys – I’m planning to get her the large rainbow for her 2 year birthday. But I couldn’t resist getting her one of the smaller ones for Easter. I’m trying to decide between the regular rainbow or this cute pastel color option. Sarah’s Silk Playsilk – Getting her the Rainbow print for Easter. These silks are a hit from peek a boo to dress up play. Do-A-Dot Paint Markers – Seeing this product recommended on several mom blogs/instagram’s I follow. Evelyn loves painting but it can be such a big ordeal for me dealing with the cleanup after. So I’m excited to try these for a hopefully “mess free” painting activity. Crayola Color Wonder Mess Free Coloring Book – These markers only work on their mess free paper and it’s a game changer. These work great in the car, at the airport or at home, with no mess and no stains! She’s always just had blank pages but for Easter I’m getting her a Peppa Pig coloring set & Daniel Tiger printed paper. **Note, the Peppa Pig link comes with the special markers the Daniel Tiger book is paper only. Bright Baby Touch and Feel Easter – Evelyn actually got this last year for Easter but i’m putting it in her basket again this year. It’s still relevant and interesting to her at 1 YR.
Where Are Baby’s Easter Egg’s Flap Book – I found this for $1 at a local kids consignment shop! What are you getting your littles? Let me know in the comments below!